Confucius was right! Today we call it interactive, but it has always been about capturing attention, engaging the mind, interest, excitement, even having fun. At eLearning.health, we know how busy clinicians are, and we assume little attention span and no patience (no pun intended). It is an on-demand world where between 100 TV channels, your smartphone, and keeping up with your popularity on social media, everyone resists one more thing to read, watch, and learn. 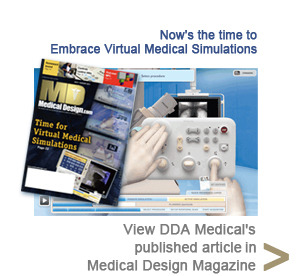 Break through the clutter with engaging and compelling Virtual Medical Simulations! DDA built the XperGuide Virtual Medical Simulation for Philips Healthcare in 2011, the first in a series of Virtual Medical Simulations. The simulation uses a wide mix of interactive multimedia to train clinicians on the use of a new interventional suite for use in new cardiovascular procedures. A custom 3D virtual environment was created to simulate an operating room, and a 3D model for the interventional suite is included along with a virtual patient. An on-screen live action spokesperson introduces the Virtual Medical Simulation, and the procedures are first demonstrated through a passive simulation that shows all the tasks of the procedure step by step along with on-screen texts. The simulation shows the entire procedure through the animation of the interventional suite and its controls within the OR context. A navigation bar at the bottom of the screen highlights exactly where in the process the trainee is at any time. The active simulation then tests users on their retention of the procedural tasks as shown during the passive simulation. On-screen prompts direct the user to articulate the controls to achieve the objectives of each specific step in the procedure. Real-time feedback is provided depending on the accuracy of user inputs. Users can review textual material or give themselves hints to advance after making mistakes. After successful completion, users are awarded a personalized certificate of completion. DDA also created a mobile app version for iPad users. The project was so successful that it received Philips Best in Class iPad App award, and later received a Tabby Award for Best Healthcare iPad App, the first year that award was issued. DDA has since developed two other Virtual Medical Simulations, one simulation-based animation, and a clinical environment simulation for Philips.